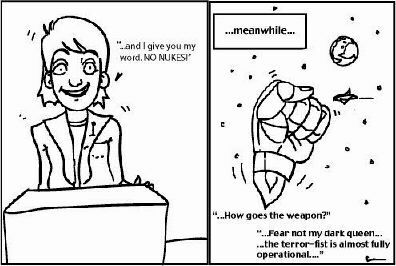 nuclear weapons | What about the bees?! Oh dear, looks like Hillary has done it again (see here). After lambasting Barack Obama for saying that he would take nuclear weapons off the table when considering action in the Middle East, it turns out she did the same thing back in April 2006. Maybe Hillary has finally decided that there is some utility in the deployment of tactical-nuclear weapons in the ‘War Against Terror’. It’s sad (and more than a little scary) that the Middle East and nuclear weapons are being mentioned in the same breath. Obviously America’s current level of military firepower is not winning any wars at the moment, but stepping up the rhetoric and groping for a bigger gun (or bomb) is not going to help. Nor will turning the region into a shimmering layer of glass – except if you go by the formula no people = no problem. Don’t get me wrong, I believe that nuclear weapons have utility, and have played a significant part in preventing great power war. They provide the terrifying framework that has allowed us to concentrate on other things. However, the problem with nuclear weapons is that once they start being used they loose their deterrent properties. The framework of fear turns into one of retribution. Coalition messes such as Abu Ghraib and Guantanamo Bay have acted as an excuse for every discontent on the verge of picking up a rifle to start fighting. Think what a nuclear strike, however surgical, would do. You want a clash of civilisations? You got it. Rather than wasting time talking about whether or not they would use nuclear weapons in Pakistan or Afghanistan, the presidential hopefuls should be talking about ways of engaging with the Middle East diplomatically, while disengaging militarily. I am not suggesting that this is an easy thing to do – on the contrary it is much easier to fight those you disagree with than reach a compromise through dialogue with them. But inclusion allows for much more control than exclusion, and keeping states within the forum of the international community (namely the UN, remember them?) is the only way to find a sustainable resolution. However, I am not sure the American public wants to hear about dialogue with figures that have been demonised by politicians and the press for so long. And remember, now it is all about votes. Lets just hope that Hillary is just pandering to the masses at the moment, but meant what she said back in 2006.